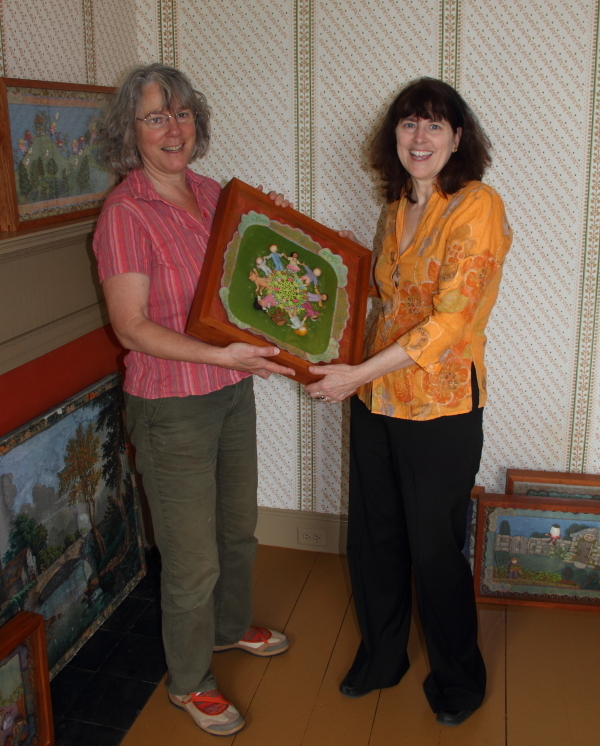 I’m pleased to announce that the next venue to host the Pocketful of Posies Traveling Exhibit is the Plymouth Antiquarian Society’s Hedge House Museum in Plymouth, Massachusetts. Twenty framed embroidered original illustrations from my book, Pocketful of Posies: A Treasury of Nursery Rhymes will be on display from now until August 31st, 2013. When I dropped off the artwork, I was struck by how intimate and charming the gallery space is within the historic 1809 house. The upstairs octagonal room has been recently restored with period wall-paper, which compliments the color palette and decorative nature of my work. Donna Curtin, the museum’s hard-working director was there to greet me. 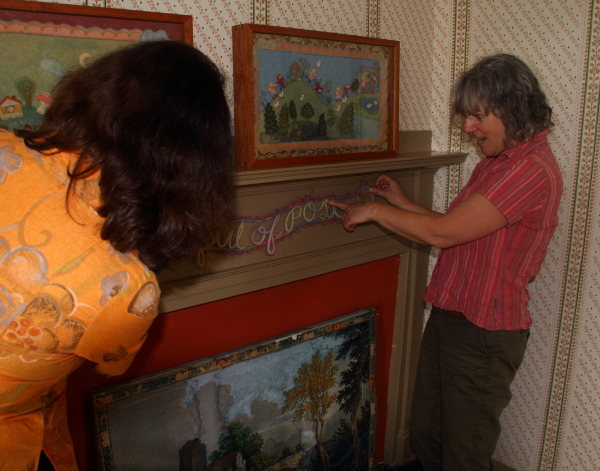 She suggested hanging the felt-covered wire book title banner under the mantel piece. 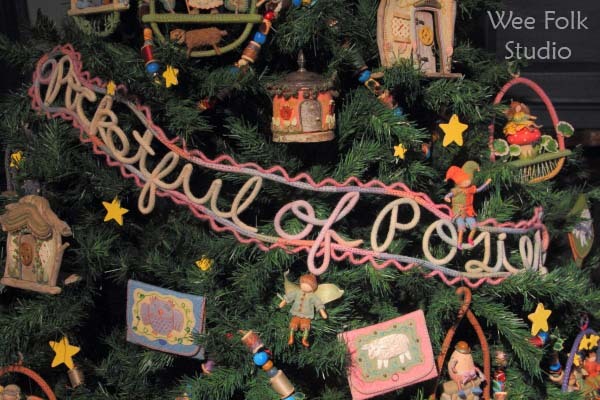 Do you remember the banner from my decorated tree in last year’s Family Trees event at the Concord Museum? At the last minute I packed it in the car with the bubble wrapped frames, thinking there may be a way to hang it up. It’s always satisfying to find another use for something you make for a specific purpose. They did a great job of hanging the artwork, which fits nicely in grouped clusters around the room. We didn’t bring a camera to the opening last Saturday so I don’t have any photos. Sometimes it’s nice to be free of a camera around your neck, but quite often one wishes there was a picture to show. I haven’t gotten in to using the camera on my phone, but that’s the next step. My show opening was held in conjunction with the well attended celebration of the Rose Briggs Memorial Gardens in back of the Hedge House, so most people who came to see the exhibit were unfamiliar with my artwork. I heard many remarks about how this was not what they expected, but they seemed happily surprised by what they saw. Some thought it would be a display of old (or modern) fabric and others were curious about what fiber art is. Labels and technique descriptions don’t match what I do. It took some time for people to understand that the framed pieces on the wall are original illustrations from a children’s picture book (a gallery copy is available). I’m used to seeing the confused look on people’s faces as I try to explain that I illustrate with fabric and embroidery. In this case, I can point to the originals and the book and explain the connection, but when I’m out in the world and have no visual aids, it can be frustrating. Most times, I just say that I’m an artist and leave it at that. If I drop the children’s book illustrator bomb, I run the inevitable risk of being plied with advice on how to get a book published. Anyway, I’m glad to share my work with people who live in or come to visit the historic town of Plymouth! June 25th, 7:00 pm I will speak about the development of my work at the Plymouth Antiquarian Society’s Hedge House Museum, Plymouth, MA. Fee: $15; $12 members. Limited seating; reservations required. To download a printable reservation form click here; email pasm@verizon.net or call 508-746-0012 to reserve a place. 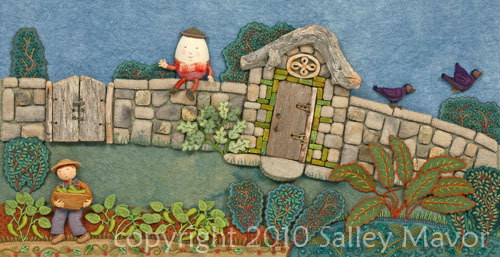 This entry was posted in Events, Exhibits, illustration, Posies Traveling Show by Salley Mavor. Bookmark the permalink. Lovely! I might actually be able to see this exhibit. We’ll be in MA in late July. I am so excited!! I will be visiting my Mom on the Cape ( Orleans) in early July and I will try to take a field trip up to Plymouth to see the exhibit. My Mom is a spinner and weaver and she and my grandmother are responsible for getting me so involved in textiles and hand stitch. can’t sit down without hand work!~!! I just finished a blog post where I linked to your Felt Wee Folk Book and talked aobut a Fiary camp that I am designing for this summer using your technique for creating the little people. We are also creating trolls! !